For the benefit of readers with little or no experience of Taiwanese elections, this is a very brief summary of how the election will proceed on Saturday. For the first time the presidential and legislative elections will be held concurrently. This was essentially a cost-cutting measure, although I discuss other possibilities and potential implications here. For the president, voters cast a single vote for a candidate nominated by a party. The winner is decided simply by the number of votes (the ‘popular vote’), and there is no equivalent of the electoral colleges or calculation of the number of electoral districts won. A simple plurality decides the winner outright-i.e. whoever gets the most votes wins. There is no requirement to gain more than 50% of the votes and there is no run-off. 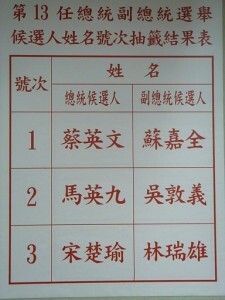 In 2000, Chen Shui-bian won the presidency with just 39% in a three horse race. The president serves a 4 year term and can serve for a maximum of two terms. 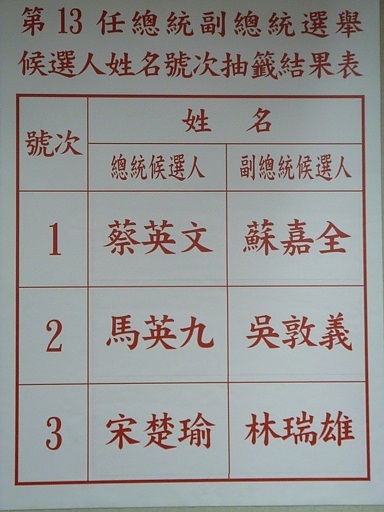 On the ballot the DPP challenger Tsai Ing-wen is number 1, incumbent president Ma Ying-jeou of the KMT number 2 and the PFP’s “spoiler” James Soong number 3 (numbers assigned by drawing lots). The Republic of China (Taiwan is the common shorthand) has a unicameral legislature (i.e. a single House) with 113 seats. These seats are distributed as follows: 73 are constituency based legislators (i.e. a local representative), while 34 are at-large representatives chosen from party lists. 6 seats are reserved for Aborigines. Voters cast one vote for a local representative in single seat districts and one for the party. Voting takes place in the district of household registration, which for many people means having to travel back to home towns from places of residence and work. The polls open at 8am and close at 4pm. In my experience, the first results start coming in about an hour after the polls shut, although because this election combines a vote for the presidency and legislature, I imagine the count will take longer than usual. I also expect that there will be more recounts required than usual, and more scope for parties and candidates to point fingers. The elections are overseen by the Central Election Commission, who have produced this basic English language video.